The almond cheese can be made ahead. Drain the almonds and then place them in boiling water for a minute. Drain them and take the skins off. Should just pop right out. Place the almonds into the food processor with water, lemon juice, and salt. Process. Drop the cheese onto a strainer with a small mesh and let it drain. You will see when it is done. Store in a container in the refrigerator. To make the salad, start by slicing the peach around to get the pit out and then cut it into 8 pieces. Brush one side with olive oil and place onto a hot grill pan. When the first side is done, brush with olive oil and flip over. Let that side go until done. It will get slightly carmelized which tastes oh so good. Slice the avocado and tomatoes. Prepare the dressing by whisking the ingredients together. Using enough greens for two, toss with the dressing. 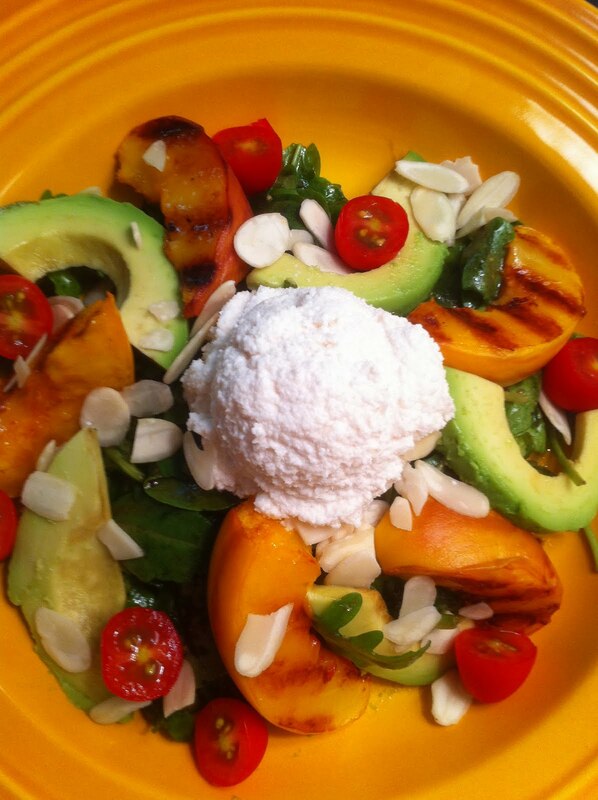 Plate it up by placing the greens at the bottom, alternate avocado and grilled peach, throw in the tomatoes and slivered alonds and top with a big scoop of almond cheese on top. Enjoy!